Camper green bear print is gonna be pretty cute at the cabin this Summer.. #camping. Don't forget to use code SUN15 for 15% off online! This ready-to-use set from @lulujobaby just arrived! The ‘Hello World’ hat and swaddle will have your newborn super cozy and make it easy to snap the perfect photo and introduce your little one to family and friends. A special gift for any mom to-be! Thank you @leelamack: "Hey Monday, we got this"..
**RESTOCK** The @yumboxlunch restock you’ve been waiting for is here! all sizes and many colours to choose from! Spring shirts and dress shorts in from @mayoralmodainfantil. Available in sizes 6 months to 9 years. We’re all gaga for this adorable addition to the shop(s). SALE! All Toms shoes have been marked down by 25-40%! Get em’ while they last! Sizes 3-11 are currently available. Keep those little toes cozy warm with adorable @bebabean #sweatermocs Available in four great colours and sizes infant to 18 months. Extra-heavy @kombicanada camp socks are here just in time to help keep little (and not so little) #trickortreaters feet toasty warm. Available in infant to adult sizes. @mollyfrankie2017 pop up happening now at our #edgemontvillage store. We love this European inspired, locally made kids clothing line. Complimentary gift wrapping - just an everyday offering since always at Pebble. Have you seen the forecast? for days...We’ve got all the best styles and colours of @nativeshoes from a size toddler 4 to a junior 6 (that’s a ladies 8 btw). Our #stonz rainboot sale is still on! It’s not too late to grab a pair (or two) at 40% off. Only the sweetest pieces for your sweetheart. So apparently #slinky is a brand name but if you’d like one a Spring Toy offers all the same joy. The @bebabean Victoria sweater makes the perfect layering piece for fall. Available in ivory and soft pink. Ready for rain? @hunterboots are here with another shipment coming soon. Happy back to school y'all! If a full rain suit is on your shopping list, we stock #muddybuddy & #calikids suits. @colibricanada : packing cheeky #litterless lunches since 2008. Herschel Supply kids backpacks, lunch kits & pencil cases are heeere! Our Summer Clothing and Shoe Blowout is Here! Hurry in for the best selection. Our IllumiPad Changing Pad and TWIST’R Diaper Disposal SYSTEM have won the 2017 Product of the Year Awards for the Baby Products and Baby Diaper Products and Accessories categories from Creative Child Magazine! We are honored! Kids and new cars are not the business. Protect your investment with seatSAVER! Who is going on a road trip this summer?! Note: we are so honoured to have our Leuie pieces included in the latest issue of @mothermusemag (issue no.03) released July 1st! Hope you had an amazing Canada Day Long Weekend! We're open from 10:00 AM to 6:00 PM, come and say hello! The Celebration starts NOW! BOGO 50% Off on ALL clothing and shoes. In Store and Online. Happy Shopping! NOW is the time to get all your summer essentials! For a limited time only ALL I Play is 15% off. Our 2-in-1 diaperDEPOT featuring Kanga Care - Rumparooz cloth diapers is awesome for many reasons. Flash Sale—online only! Entire store $2.99 & up! #Happy #NationalSelfieDay! Just be your selfie and snap a few of you and yours…then share with us below, pretty please! SUNS OUT! All NEW Sunnylife Baby Floaties - in stock now! In store and online. Perfect for your summer getaway! Just in time for Father's Day! Come see us this weekend for some great savings on your favourite brands! We are on sale! Don't miss it. I clean our house with C is For Clean, a vinegar-based cleaning product with beautiful, natural scents. All Diono Car Seats are on sale for a limited time! Get yours before their gone! Enjoy it while you can! Don't forget to visit us in store or online today - your LAST chance to get an amazing deal on all things NUNA! We appreciate you as our customers and as fellow parents. We know discounts are a small way to show it, but this is our way of saying thank you for over 40 years of support. Thanks. We absolutely love the new collection of Ben Sherman, comfortable, elegant and fun! An excellent combination for your boy! Red, White, & cute looks for everyone! Cuteness overload! This beautiful Patachou dress will make a statement at your next event. Happy Victoria day! Enjoy your #longweekend lay in tomorrow morning! We are open 11-5 at both store locations. See you then! If you can't make it to the show tomorrow, here it is: the patented TWIST'R® Diaper Disposal System! So excited to show off our dad's latest product. Our amazing collections are waiting for you, see you tomorrow! Who doesn't love FREE shipping?! 4 Days Only. Site Wide within the Greater Vancouver Area! Due to a technical malfunction with our phone system, we have not been receiving voicemail from all our lovely customers. We are IN LOVE with this nursery featuring the Babyletto Lolly Crib! Happy Mothers Day to all the beautiful souls out there that decided to embark on this journey! Thank you for sharing your #OneBigHoppy Spring photos with us! Mother's day is coming up and we want to see your favorite snaps of you and yours! The new Ace shoes are here! Lightweight, machine washable, designed in Vancouver, and ridiculously cute! Get People Footwear on their feet, and yours! The latest delivery from Hiroshi Fujiwara & Ryo Ishikawa’s, Denim By Vanquish & Fragment is now in-store and online at Livestock. Super pumped to welcome @northkinder baby and toddler apparel to Pebble. This Canada proud company combines the comfiest fabrics with the most effortless style, all with the ongoing commitment to stay home grown. Add to that a super affordable price tag! 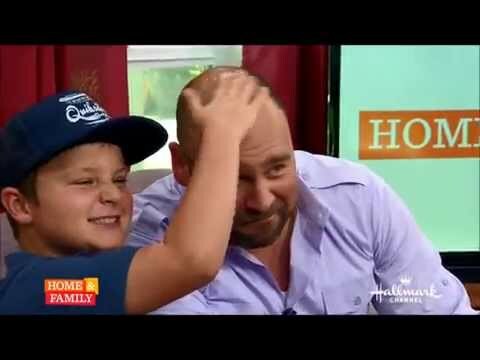 Prince Lionheart on Hallmark Channel's Home & Family show! #150 - 1666 Johnston St.